"She is so gorgeous! Her swaying in the breeze is so delicate! Her white petals shine so brightly! She is the flower of my life," the bee thought, humming happily by. As the bee continued to hum by this beautiful lily, day in and day out, the flower finally noticed him. They became acquainted with each other and started to enjoy its other's company. Love sprung in both of their hearts and wedding plans were formed and celebrated with a big fanfare. "You will be my only nectar," the bee promised. "You will be my only glorious husband," the lily replied. Soon though, life seemed to accelerate. There was always so many things to do. Still both the lily and the bee hoped that somehow life would slow down and that they could enjoy each other the way they used to. Time went by. By now, both had many tasks, more than ever before. Besides the daily tasks of life, their son bees and lily daughters were demanding more and more of their attention. It seemed to the lily that she never received any help from the bee. In fact, she thought that he was so busy with his own work, that he ignored her. 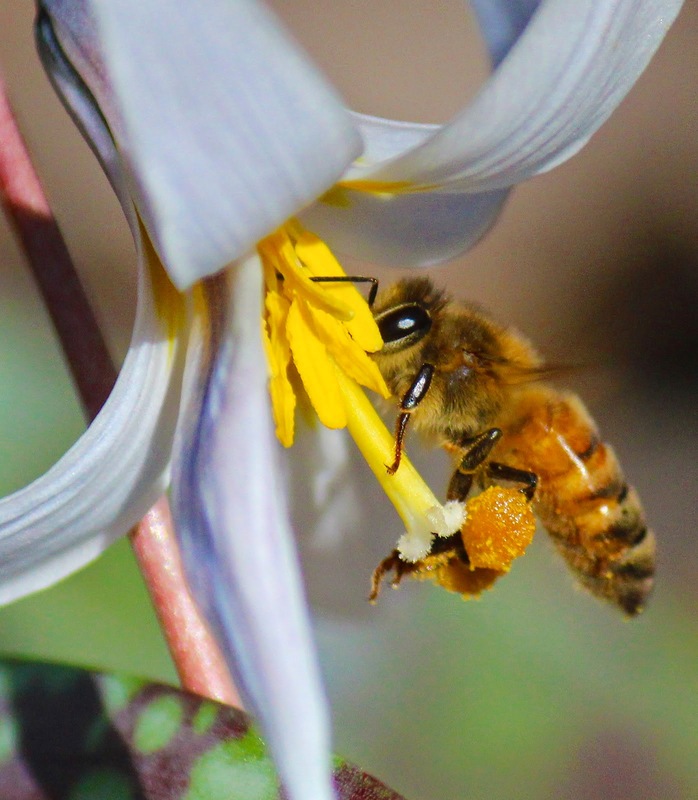 It seemed that the only thing of importance to the bee was to feed himself from her pollen. What about her? Why didn't he put her first in his life? Were his tasks more important than her? It's then that she noticed the awful looking thorns that were growing around her. "Where am I, and why is my bee not taking care of me?" she wondered. But the thorns became familiar. They began paying attention to her, and soon they didn't seem threatening at all. One, especially, tried to become her friend. At first they only talked about things they had in common and things they enjoyed. "Wow! That thorn is so nice and we have so many of the same interests!" thought the lily. "I wish my bee would pay me this much attention!" And so her thoughts started to wander more and more to that thorn that seemed to care so much for her, and soon she starting sharing her burdens with it. And it understood her! It even understood how inconsiderate her bee was! It started to dwell on how much better it could take care of the lily if it were in the place of her bee. And the more the lily contemplated this, the more repulsive and egotistical her bee became in her mind. The thorn was so much nicer! And her attention became more directly focused sideways, on the thorn, and she no longer looked up to find her bee humming by. As the lily and the thorn grew closer, and the bee seemed more and more distant, the lily convinced herself that the thorn was the one who really cared for her. Her thoughts began to wander down dangerous pathways: "Maybe I should…" But then the thorn pricked her, and a drop of blood surfaced on her petal. The blood seemed to fill her entire being. "Ouch!" she cried. "What have you done?" Before long her bee came by, and the lily called out to him. She told him everything about the thorn who had hurt her so badly. What had seemed so innocent had nearly led to the break up of a relationship that had once been so cherished! This story, however, has a happy ending. The bee and his lily began to talk to each other again--to really communicate with one another. The bee found time in his busy schedule to be with the lily, to help her with her many tasks, to listen to her and to love her. Priorities were reset, and they began enjoying an intimate relationship, closer than ever, until the end of their days. They realized that their friendship was precious, and that the thorns could only destroy them. My friend, how is you relationship with your spouse? Are you still communicating with each other and sharing all you intimate thoughts with each other? Are you spending time with each other and expressing your love towards each other? If not, it is still not too late. Even if your mutual feelings have drifted, start reaching out to your loved one, now. Don't let the thorns of this world take advantage of your alienation. Spend time with each other. Listen to each other and share with each other your inner thoughts. Before you know it, your relationship will be closer than ever, even closer than the day you married each other. Not only will you remain husband and wife, you will become lovers and will develop an appreciation of each other that you never could have dreamed of. The same is true with your relationship with God. Are you still communicating with each other and sharing all you intimate thoughts with each other? Or is it a one way communication, where God is trying to reach out to you? Are you spending time with each other and expressing your love towards each other? Come back to Him and enjoy fellowship with Him. Only He is the One who can fulfill your dreams. He is waiting for you. Instead of concentrating sideways to the worries and attractions of life, let us look upwards and admire the One who really does care for you! Dear Lord, help us not stray from Your fellowship. If we have help us come back to You so that relationship can be a light shining in this world. In Jesus’ Name, Amen.